Leers Weinzapfel Associates designed the Paul S. Russell, MD Museum of Medical History and Innovation, at Massachusetts General Hospital. With the help of many philanthropists including MGH doctors, a narrow strip of land on Cambridge Street at the corner of North Grove Street was carved out for the glass and copper-clad building, which has been drawing the attention of passing motorists. 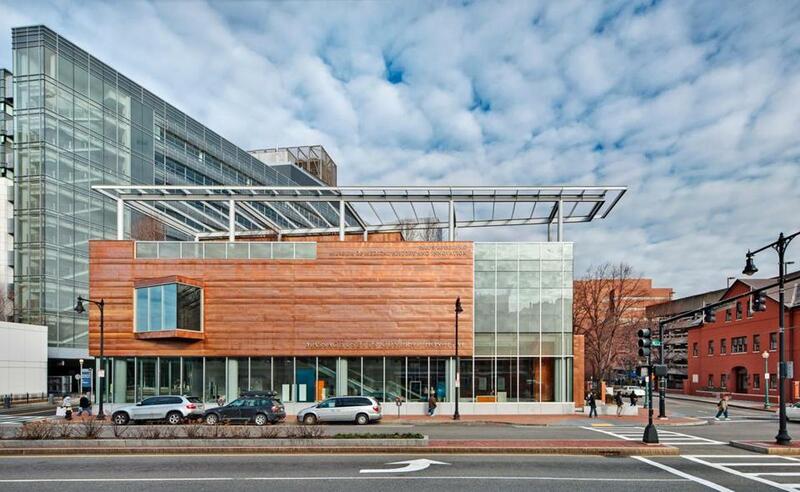 The Paul S. Russell, MD Museum of Medical History and Innovation (named for the MGH transplantation pioneer) is the symbolic “front door” to the entire hospital complex, a gesture to visitors that they are particularly welcome, confirmed by free admission. Five hundred people toured the facility in its first week. Austen explains that the words “history and innovation” were carefully chosen to be interpreted in the museum in a multitude of ways. First, the unusual copper covering of the building — a 2012 innovation of chief architect Jane Weinzapfel — also pays homage to a piece of MGH’s oldest history: the copper dome of the original Bulfinch building (viewable behind the Wang Ambulatory Care wing). Next is the contemporary feel of openness upon entering. The long and narrow three-story space, even on a dreary day that obscures the John Hancock tower in the distance, brings in the outdoors through dozens of panels of glass. Their clean and soaring angles complement the muted patina of the antique wooden instruments on display — innovation and history, once again. ■ A small statue of Florence Nightingale given by her to Mary Parkman, a founder of the MGH School of Nursing, on an 1872 visit. ■ Early surgical instruments such as bistouries (a type of scalpel) and forceps with tortoise-shell handles from circa 1855. ■ A tonsillotome, also known as the “tonsil guillotine,” for the removal of tonsils — a procedure commonly performed in the late 19th and 20th centuries. ■ A portable wooden medicine chest from 1850 featuring hinged shelves and compartmentalized drawers for the potions, dishes, and implements used to mix prescriptions. The traveling kit, which belonged to MGH surgeon Dr. Samuel Cabot, was a 19th-century fixture, as patients, especially those well off, much preferred in-home treatment. Showcasing today’s medical innovations are a full-wall mural of a contemporary MGH operating room; a video on “targeted” medical therapy of tumors, organs, or single genes; an infant’s incubator that MGH has invented for developing parts of the world, featuring readily available components such as auto headlights for easy repairs; and a “deconstructing diabetes” display that highlights MGH’s three-decade-long participation in a study to curb the alarming expanse of a disease that now affects 26 million people. In addition to the several dozen exhibits on the street level, the upper floor offers a collection of oil portraits of prominent medical figures that will help link names and faces — such as Gray and Warren — to the familiar MGH buildings that honor them. For the weary visitor or anxious patient, planners included a serene rooftop garden oasis to provide respite from the surrounding bustle. 5 p.m., free. Half-block from Charles-MGH MBTA Red Line stop. Diane Speare Triant can be reached at dtriant@gmail.com.